Nice to see you here Tuller. Renamed most of the files in Bagnon_Core. Please completely delete all bagnon folders before installing to prevent conflicts. Added a confirmation dialog to purchasing a bank slot. Dropdown menus now close if thier parent frame closes. Now using a completely custom item button to prevent conflicts with other mods. Added slash command /bgn reverse - Toggle to show bags in a descending/ascending order. The strata of of the bag frames is yet again set to medium. Fixed a bug causing problems with using other inventory mods with just Banknon. Fixed a bug that prevented linking a cached item in chat from showing all the information known about the item. Fixed a bug causing slots to be miscolored as ammo slots for cached items. Added bags to the inventory frame. 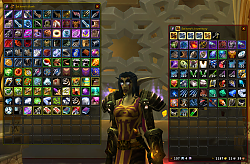 Fixed a bug causing the purchase frame to not hide when you have bought the maximum amount of bags. Fixed a bug causing bag slots to not properly update when switching to a character with less bag slots via BagnonForever. Fixed a bug causing the right click menu to not close if the parent frame closes. Fixed a bug causing the money frame to display the player's money for other characters than the current player. Scaling a frame should no longer scale the options frame along with it. Bagnon_KC is an implementation of Bagnon_Forever that reads from KC_Items instead of me having to create an entirely new database. The benefit of using it is that you'll have no redundant saved data versus using KC_Items and Bagnon_Forever. Currently, however, Bagnon_KC is not nearly as memory efficient as Bagnon_Forever. It might be that I'm calling functions I shouldn't be, or it might be a problem with KC_Items, and if so, its hopefully something that will go away as KC_Items matures. Err, turns out I did include Bagnon_KC in the zip for here It will be the last version to include it though. Last edited by Tuller : 01-19-06 at 10:31 PM. Hey this mod ROCKZ!!!! Keep up the good work. Last edited by mistik911 : 01-21-06 at 10:38 AM. Last edited by mistik911 : 01-27-06 at 08:43 PM. When I have CTraid going (I have the groups all in the same place as where bagnon comes up) and open bagnon parts of the CTraid groups appear on top of the bagnon window. That should have been something I fixed in the most recent version. I'll make it a little bit thinner again, anyway. Open up the settings menu, and change the layer of the frame to the highest it can be. Just needs a minimap icon (to trigger "/bgn bank"), and it'll be #1 in my book. However, I did notice that the options box will get overlapped by my action bars, and will get cut off the screen sometimes, requiring the bag window to be unlocked, and dragged upwards some in order to access all of the options. 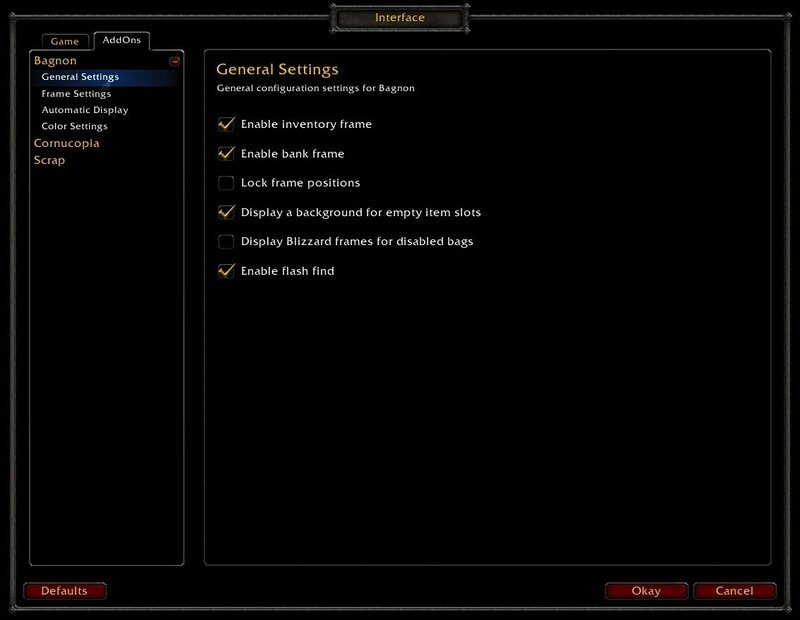 This could be fixed by making the options window moveable, or by making the anchoring position better. 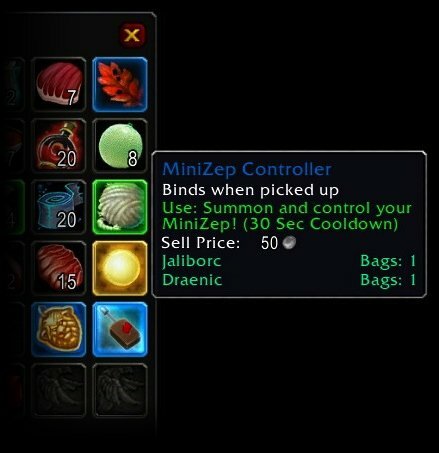 Despide those minor flaws, this addon is the best bag/bank addon I've seen yet! Keep up the good work. like the previous poster w/ctra, i too need my inv/bank frames ON TOP of *most* elements. the slider feature is good, but doesn't work. sliding it up to HIGH prevents double-clicking the title area and selecting your other character's inv/bank. 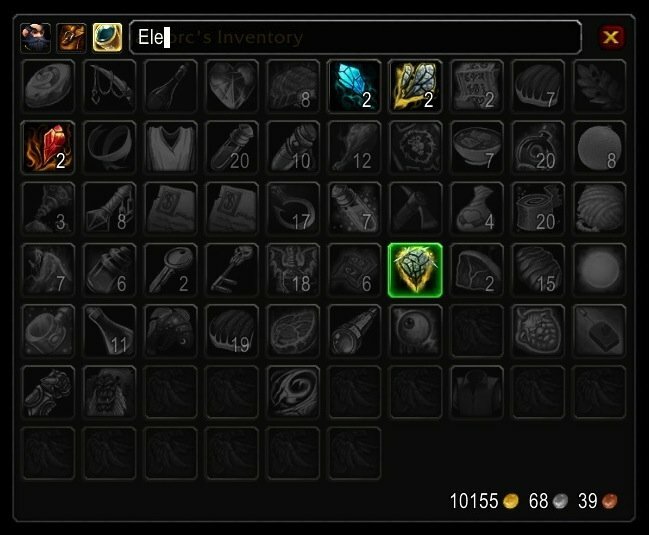 the menu comes up behind the inventory frame, breaking the menu :O same for options. i really prefer to set options via slash command too. the slider bars go so fast and make fine tuning difficult. memory usage. i know that moving an item from one slot to another will use ui memory. this mod seems to keep it low (thank you!) at .04mb per move. however, mousing over items (shakign mouse back & forth over items) uses up LOADS of memory. i cant tell if this is due to kcitems populating the tooltip for the item, or this mod doing something. i havent seen an issue when using kcitems + mybags though. another HUGE memory leak happens when opening the frame and hovering your mouse over any of your backpacks. memory jumps by .20mb (1/5th megabyte) every second. big mem leak there. last but not least, i dont like the mouse-over box on the title. a little drop-down menu like mybags would be much better. 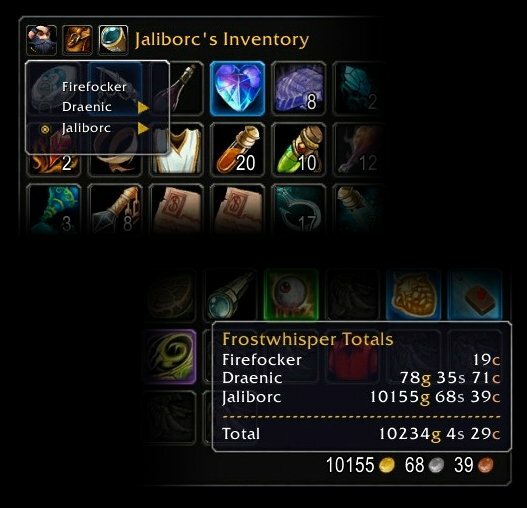 there are already too many tooltips in the game, and we dont need even more just to get a drop down list :P just an annoyance to me i guess. i do like the integration with kcitems too - very well done. 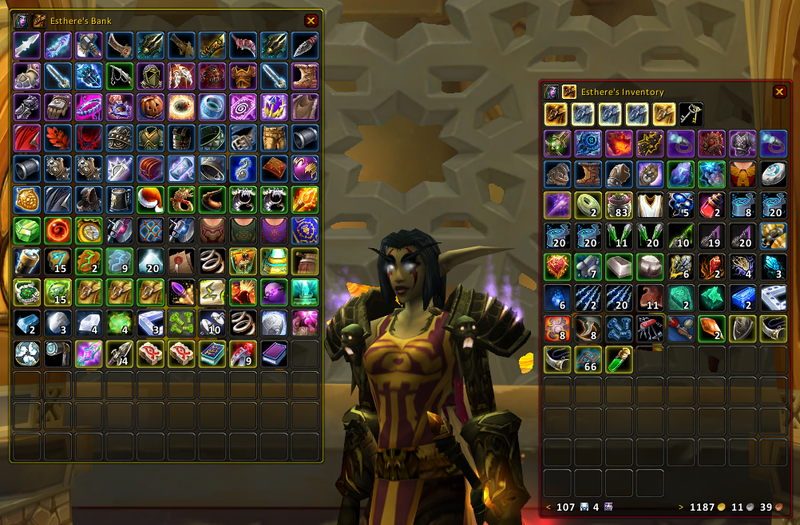 i didn't even have to log onto my chars to "see" their inventory/bank items upon first use. awesome! Bug reports for any of my mods can now be submitted via this link. You can get there via tuller.wowinterface.com, and I'd prefer any bugs be submitted that way since I can get an RSS feed of em. Feature requests can be submitted here. That's actually a bug I fixed, but I haven't released the version here yet. I actually figured that out when I made the maximum amount of rows such a big number. I'll probably replace the slider with a text box. I'm trying to avoid slash commands whenever I can, though. I think there's actually been an increase in memory when moving an item around in your bag. Fairly sure it happened around the time I added bags to Bagnon. KC_Items is at least part of the reason you're getting a big increase in memory usage when hovering over a bag or mousing over items rapidly. There was an issue earlier with simply hovering over an item using large amounts of memory with KC_Items enabled. 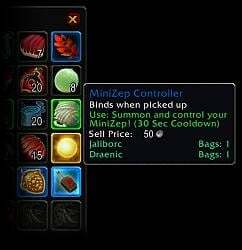 I'll take a look at MyBags' tooltip code and see what the author did differently. 1.10 adds dynamic frames, and that should reduce Bagnon's total memory usage. I'll check it again, but the most recent version on here should have changed Bagnon to only move if you drag the title portion of the frame. i still get the .20mb/sec mem jump without bagnon, using mybags. i really dont knwo why hovering over teh bags would give that much memory usage (probably a rogue OnUpdate somewhere in an add) because you dont really even need a tooltip over those bags. if i hover mouse over ANYTHIGN ELSE evenitems IN the bag, i dont get this much mem usage. Heh had a little typo in the /bgn help command for any of yall who had the original v336. That's the only change in v336a. could you look into bagnon_KC for the new .941 version?